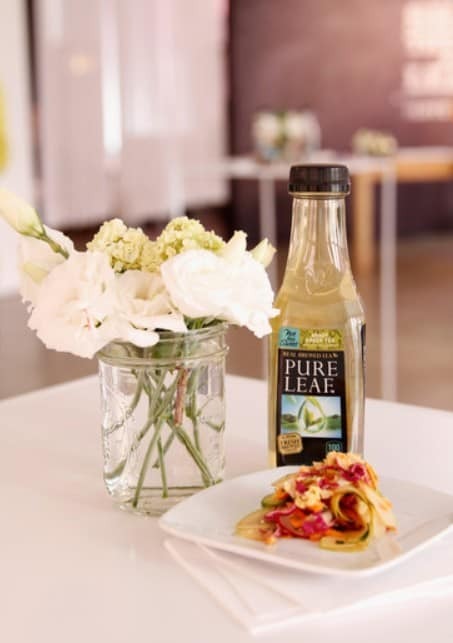 Top Chef judge Gail Simmons has created some new recipes to help Pure Leaf Iced Tea kick off its Love of Leaves campaign at its luncheon in NYC. In addition, every social engagement from fans on Pure Leaf’s Facebook or Tumblr, and use of the #loveofleaves hashtag on Instagram and Twitter, Pure Leaf will donate $1 to Wholesome Wave, an organization focused on increasing access to local foods in underserved communities. Salads, whether a lettuce or potato salad, make great side dishes in the summer. Perfect to go with your meat you just took off the grill. 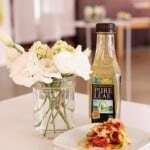 This Plum, Mint & Pea Salad is made with a Tea Vinaigrette made with Pure Leaf Unsweetened Iced Tea! A great summer salad recipe! Place arugula in a large serving bowl. Add snap peas and mint, and gently toss. Top with plums, nuts and crumbled goat cheese if desired. In a small bowl, whisk together the mustard, vinegar and tea. Add olive oil in a slow stream, whisking constantly to emulsify. Add salt and pepper, and combine. Divide among four plates to serve. Gail Simmons, TV personality and Special Projects Director at FOOD & WINE magazine. If you would like to see more from Gail Simmons, check out her book Talking with My Mouth Full: My Life as a Professional Eater! That’s such a great idea, and very unique. Thanks for sharing with the Merry Monday Linky Party! Looks delicious and perfect for Summer!!! Thank you so much for linking up at Tasty Tuesday! Your recipe has been pinned to the Tasty Tuesday Pinterest board! Please join us again this week! This looks amazing. I’m always looking for new salad recipes.